Sherab Khandro desribes her painting style as a mix of the ancient and the contemporary, strongly influenced by the altruistic, meditative practices of Tibetan Buddhism and her experiences of modern life. It is meant to tell a story, spark inquiry, invite a deeper reflection. Featured prominently in her paintings is the neo-impressionistic style of Pointillism. Sherab Khandro was ordained as a Buddhist nun in the Tibetan tradition for 15 years. 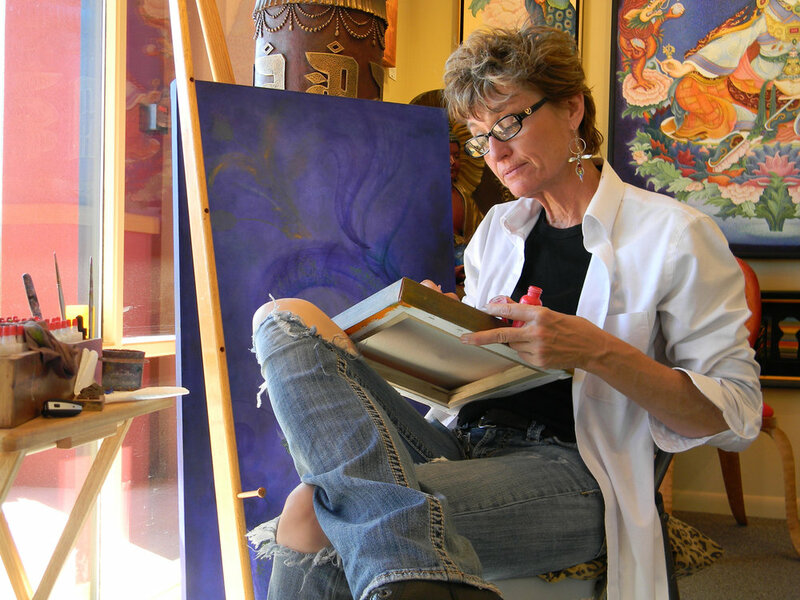 In her art, Sherab utilizes the intent of her vow as a Bodhisattva, a vow taken by Buddhists to return again and again until all suffering has come to an end: each stroke of her brush holds a prayer of compassion. What kind of meditation do you regularly practice? Please, describe the method you use and its effects. A very big question, thank you for asking. At the center of my meditation practice is the simple yet profound practice of stabilizing the mind through breath awareness meditation. This practice keeps me in touch with the quiet knowing within and helps me to maintain a certain spaciousness in my mind. In addition, I practice contemplations of the fundamental human values of compassion, loving kindness, patience, joy, generosity and gratitude. I engage opportunities to practice these qualities throughout my day. Inherent in my work is the practice of envisioning a peaceful world, an end of suffering and the ultimate happiness of all beings. In what way does your meditation experience contribute to your creative process and your art? Meditation lays a foundation for deeper listening. Meditation connects me with the natural divinity that lies within. From this place, I trust what comes forth will nourish the moment and fulfill the intentions for my work. Through my training in Tibetan Buddhist art and philosophy I became aware of the potential for art to be a spiritual event. Setting an intention to be of service to all beings, centering in meditative ease, I invite an expression of the Divine. Line and color flow into form, an outer display of the awakened or awakening mind. The philosophy of kindness and giving is an integral part of all classical systems of meditation. Do you think these principles could be used to create better art? If so, in what way? As an aspiring bodhisattva, I believe the intention we establish for our lives influences the results we create. I believe there is power in each thought, each word, each action. Through the movement of our mind and our bodies, the energy of our intentions becomes a part of our work. As artists, if we include a philosophy of loving kindness and compassion in the work we produce, loving kindness and compassion will consciously or unconsciously be experienced in the work. The work itself becomes our voice. What are we saying to the world through what we are creating? What energy do we bring alive? How can it be of benefit? Why do you feel so drawn to the pointillist technique? I fell in love with this style upon my first introduction, at the time I was deep in my study of Tibetan Buddhist art. The technique of pointillism spoke to me on many levels. This technique uses only the purest and brightest colors, no neutrals are included on the palette. Within each field of color there are many colors, analogous and complimentary harmonies. This spoke to me of the rainbow quality of the Buddha’s display. As we experience the painting from a distance the colors blend, as we look more closely we see the many harmonies of color making up our experience. These layers of tiny individual dabs of color cause me to reflect on the illusory nature of appearances. What appears solid and real is neither. How reliable are our senses? How often do we take our perceptions at face value? Is the Buddha found in the dot or in the spaces in between? I like my work to invite inquiry into the nature of our sensory experience and ultimately the purpose of this life. Additionally, I experience each stroke of the brush as a distinct moment in time. Each stroke is offered as a jewelled universe, and like the practice of mandala, is expanded into space and offered for the benefit of all. What themes do you find most compelling to explore in your art? I am drawn to imagery that inspires conversation about personal and global transformation. Through my study of the creation and purpose of the sacred art of Tibet, I was introduced to the power of art to tell a story, to hold energy, to remind us of fundamental spiritual values and practices. Art becomes a tool to educate and inspire. I explore images from Eastern spiritual traditions along with totems from nature. Line and color are powerful sources of expression. As each piece unfolds, it reveals layers of meaning and story. Each one meant to remind us of our own potential to awaken, to engage our hearts and invite us to live a life of purpose and passion. Is there a message you hope to leave with your viewers? You are powerful beyond measure. As world citizen’s, we have an opportunity, quite possibly a responsibility, to bring forth our best qualities for the benefit of all. I invite myself and others to give birth to the deepest aspirations of our heart. Through our words and our deeds may we speak only of loving kindness, compassion and peace. What was the best advice you’ve been given as an artist and a person? The best advice I received as an artist was, “just play.” The best advice I received as a person was when I asked Lindsey Waggner what advice she would give a budding public speaker. “Just Love them,” she said.